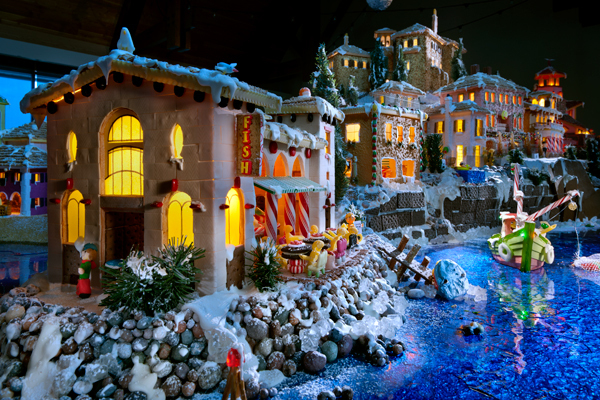 Every year the folks who work at RLPS Architects come together to create a spectacular gingerbread creation,and I have been lucky enough to be invited to shoot along with the main photographer who always documents this for them.Each year I walk in,I just stop and stare at all the details and funny little vignettes they come up with. This scene of a town square is just one small corner of the creation. The following paragraph is from their website and describes the display better. I did not do too good a job this year with my shots but it’s always fun trying. Drawing from images of Scandinavia, employees and their families spent countless hours transforming various edible materials into picturesque cottages, unique shops and mining operations. The candy structures are positioned along a fishing pier made of pretzels and mountains forested by ice cream cone trees coated in sugar sprinkle foliage and icing snow. The raw building materials for these creations included over 70 pounds of Charms hard candy, 30 gallons of icing and more than 50 pounds of candy, pasta, crackers and cereals. 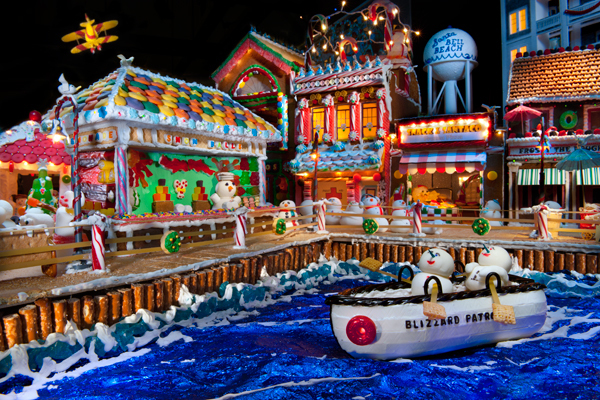 Every year the folks at RLPS Architects in Lancaster,Pa create an amazing themed gingerbread display for the public to enjoy. This year the theme was Italian Ice and this is one of a few images I was lucky enough to be able to shoot. You can’t take all the detail in on one visit because it is amazingly detailed and took 2000 hours to complete.Make sure you visit lefever photo under my artists that inspire tab. He is the primary photographer for this creation and most certainly will have amazing images. Yet another scene from the Dickens gingerbread display this year. The ice spins with the skaters on top and to see the myriad of cords and plugs under this display,you would think you are watching Chevy Chase in Christmas Vacation. The town is full of street lights,and various items needing power.This was taken with a 17mm in pretty close to show the tiny skaters better. 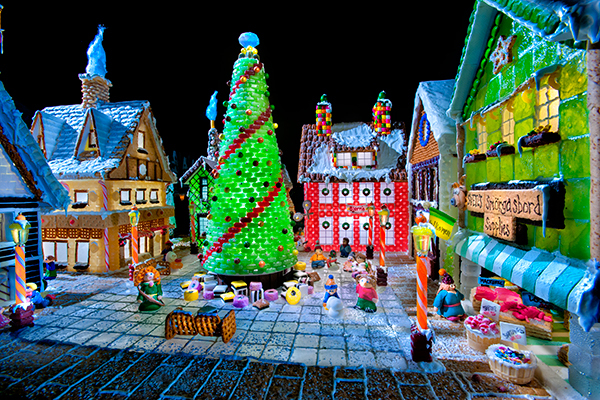 Another highly detailed confectionary creation from the Dickens village gingerbread. The main establishment is titled hark the Harrods and one can look at all the details in amazement at the amount of work the architectural firm puts into this Christmas creation. The paper spirals near the top actually spin creating the effect of smoke rising from the chimneys. This is yet another display from the historic mansion Christmas event. This display was created by a local bakery and the tree is adorned in fresh gingerbread ornaments that include snowflakes,trees and ginger bread men. There appeared to be other food items on the tree but I was not exactly sure what everything was.The left window sill features gingerbread houses and various other items round out the composition.The first exposure was done capturing the exterior light and then everything was lit by a hand-held deer spotlight in a very dark room. When you do this technique,you must be careful not to kick or bump anything as you light things or you get registration problems. This was the only shot I did this year alone in the mansion,which can be a little spooky in the dark as you hear every sound in the old structure. Thankfully the strong smell of gingerbread filled the room and kept my mind from being distracted by noises. If only I would have had a big glass of milk,I might have been able to sample the bakery delights.